One of my favorite things to do on the weekend is fix a hearty breakfast for my family. During the work week, my husband usually grabs something quick and easy (aka Little Debbie Oatmeal Pies), and I almost always eat a bowl of cereal. I have zero complaints about eating my cereal (it’s basically my favorite food group), but it doesn’t satisfy my craving to actually cook something. Cooking is one of my favorite ways to provide for my family, so this past weekend when my husband woke up early to cut the grass and my daughter was still snoozing, I jumped at the opportunity to cook my heart out! I had 3 plump and juicy peaches sitting on my counter, so I started trying to think of a way to incorporate them into our breakfast. I broke out my favorite skillet and whipped up some pancake batter. I had a hankering for fluffy brown pancakes, but this time I thought that I’d ditch the syrup and go for something even sweeter using the peaches. This Easy Peasy Peach Compote takes less than 15 minutes to make, so while I was flipping flapjacks I had my peach sauce simmering away in a small sauce pan. 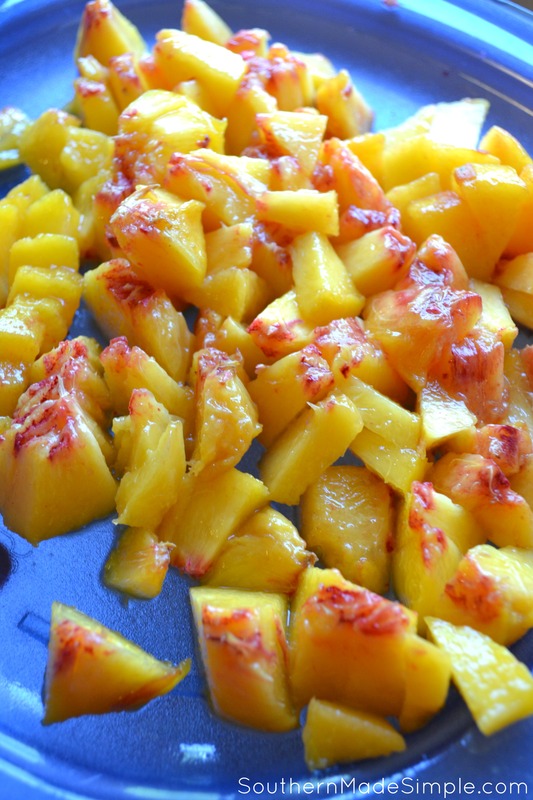 In my opinion, I could always ditch the syrup in exchange for the golden sweetness of this succulent peach compote. It’s absolutely delicious! I took 3 peaches and peeled, pitted and diced them. I put them in a small pot on the stove and added in some brown sugar, water, vanilla and cinnamon. I brought them to a boil and allowed them to simmer for about 12 minutes. 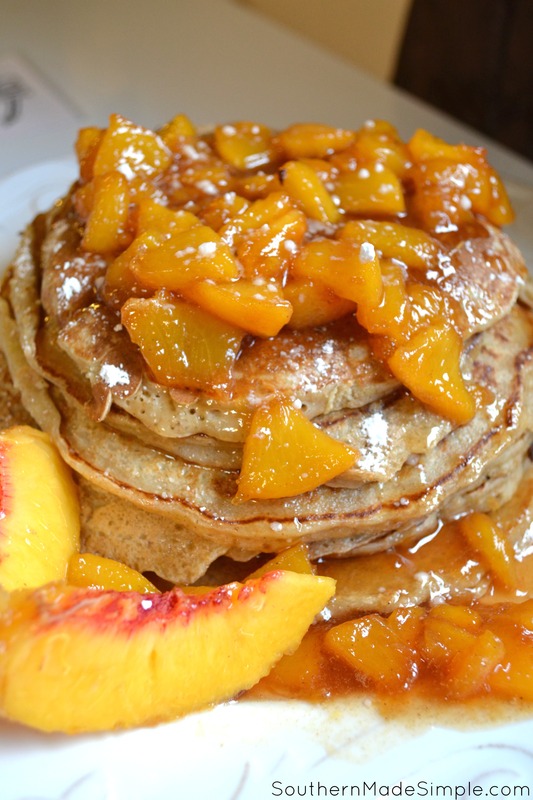 The brown sugar blending with the sweet peach juice forms a thicker syrup-like sauce – making it PERFECT for pouring over a tall stack of pancakes! Making a fruit compote is super easy, and this recipe can be made with nearly any fruit. It’s a great addition to top your muffins, cakes, or yogurt with! Here’s a free printable version of my recipe. Enjoy! Reduce heat and allow to simmer for 12-14 minutes, being sure to stir occasionally. Sauce will gradually thicken and become syrup-like. Remove from heat and allow to briefly cool. Serve over fresh pancakes, muffins, slices of pound cake or shortbread, or however you'd like! I chose to sprinkle a tiny bit of powdered sugar on top of my compote and pancakes. That's completely optional - but it's delicious! What do you love to put fruit compote on? Have you ever tried it on top of your pancakes? Do you have another recipe you’d love to share? Leave a comment below and let’s chat!